One thing I look forward to every summer is shopping at local Farmer's Markets. I love knowing that my produce was just picked that day and packed with the maximum nutrients. I also love supporting my local economy. Did you know that when you shop at local farmer's markets as much as $.80 of every dollar goes back to the community where you live. Compare that to $.09 on the dollar that goes back to the community when produce is purchased from local grocery stores. It's just so refreshing to get outside and smell the fresh air and see all of the fresh produce and flowers. For those who are new to shopping at Farmer's Markets your first few trips can be a bit daunting. It's definitely a different experience than shopping on aisle 9 at the grocery store. Here is a list of my favorite tips to help you navigate those first few trips. Keep a list of all the local farmer's markets and hours in a convenient place. I keep one on the refrigerator and in my work bag/purse. Look at Local Harvest or Eat Well Guide if you are unsure where your local markets are located. Take Your Kids! This is a great learning opportunity for them. Many times if they can pick their own veggies, they will be much more apt to eat them. Bring a re-usable shopping bag (or two) that can hang over your shoulder to help carry everything out comfortably. Go early to get the best pick of produce. If you go early, it's also a nice time to chat with farmer's about their growing practices. Get a cup of herbal tea or coffee and then take some time to scope out the whole market before starting to purchase. This way you can see whose produce looks the best and see the best prices. Bring cash and mostly small bills like $5 and $1 bills. As you buy, place heavier items in the bottom of the bag to preserve more tender vegetables. Buy in bulk. If the green beans look especially nice - buy alot. You may get a discount for buying more and if you lightly steam them when you get home you can eat some for dinner and freeze the rest for winter when fresh produce isn't as plentiful. Make sure you ask if the produce is grown locally. Some markets demand only locally grown produce, others don't. Asking a vendor about if he grows his crops using organic or sustainable practices is a better question than "is your product organic"? If you ask if produce is organic, a vendor will assume you mean certified organic and tell you no. Many farmers grow completely organic produce but have not been certified either due to cost or some technicality that would keep them from certification. There are many wonderful farms that you don't want to miss that sell organic produce but are not "certified organic." Get out there and enjoy all that your local farms have to offer! I'm mad in love with our farmer's market here in Phoenix. We have a grower who grows certified organic. The prices and freshness are freakin' amazing! I'm doubly stoked because he just started a rad CSA! I had my first watermelon of the season from him this week and I swear I went straight to heaven with the first bite. Locally grown and organic... life is good! 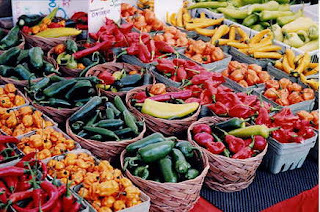 We have just added your latest post "10 Tips for Shopping Your Local Farmer's Markets" to our Directory of Shopping . You can check the inclusion of the post here . We are delighted to invite you to submit all your future posts to the directory for getting a huge base of visitors to your website and gaining a valuable backlink to your site. We have just added your latest post "10 Tips for Shopping Your Local Farmer's Markets" to our Shopping Directory . You can check the inclusion of the post here . We are delighted to invite you to submit all your future posts to the directory for getting a huge base of visitors to your website and gaining a valuable backlink to your site.